Here’s an interview I forgot to post from a few weeks back, appearing on the Monsterpictures site. I like that first line. Sterns is a good fit for building on the Taylor legend. 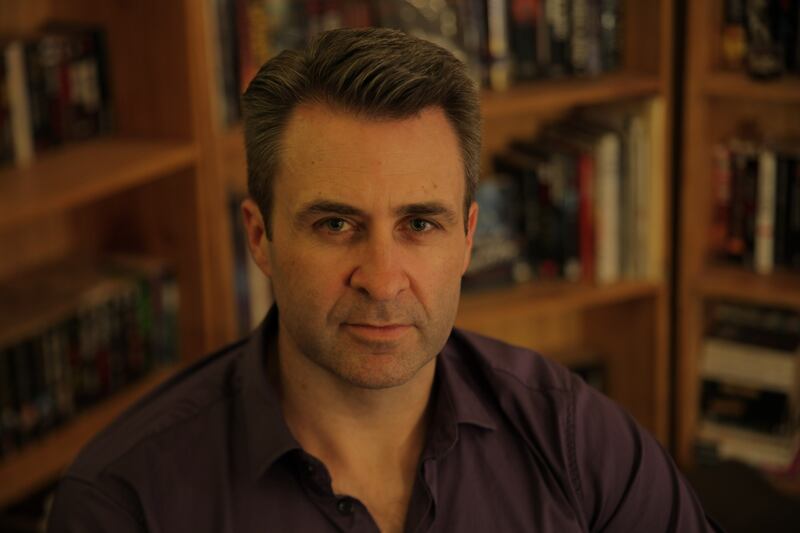 He is the author of several award-winning short horror stories, and the upcoming werewolf novel, Blood. He spent time as a lecturer in Gothic and Subversive Fiction, edited the Journal of Australian Horror Writers, and is a PhD student in postmodern horror. The most fun a writer can have, Sterns says, is in creating the backstory for frightening figures like Taylor, and the author was in his element during the writing of the Wolf Creek novel. The new film, in turn, allowed Sterns to enter into far murkier territory, upping the ante in Taylor-derived devastation. Sterns’ scenes, at times, were of the sort even he was surprised to see onscreen. Sterns is currently working on another novel, a number of screenplays, and a film version of Blood. Monster caught up with the Sterns to discuss the novel, available now through Penguin Books, and the sequel, which is on DVD and BluRay through Roadshow. MONSTER: How did you get involved with co-writing Wolf Creek 2? STERNS: Greg and I shared an office in Fitzroy (Melbourne) in our early days. We’d trade scripts back and forth for comment, including his script that became Wolf Creek. I even had a cameo in that film. We bandied around sequel ideas after its filming, until hitting upon something we thought was innovative and ‘big’ enough to warrant the sequel. Given my interest and experience in the horror field, even then, Greg said: Great, go off and write it. We’ve been developing the script since, until Greg had the opportunity to return to Mick’s world and we secured the funding to finally shoot it. MONSTER: From script to screen, how different if at all, did the film turn out? Was everything in the script in the film? STERNS: Well, as with any script there’s an incredible amount of changes along the way. Amazingly the structure of the film — and its central idea — is still the same as it is in my initial treatment and first draft. We set the film up as being about a backpacking couple, only for this to be playing with audience expectations, and for it to really be about an encroaching character. I was channeling Psycho in this. A lot of cosmetic stuff has changed along the way — dialogue, particular scenes and how they play out, and the opening and ending went through endless variations. And, of course, there were dialogue changes in rehearsal. Even on set with John adlibbing and playing around with lines. But it’s quite faithful to the shooting script. And I’m actually surprised some of the more extreme moments (that were excised from the Australian theatrical release, but can be seen in all their glory on the Blu-Ray version) were ever filmed. MONSTER: Was it frustrating to know the film was cut for theatrical release? STERNS: I’d been telling everyone all along how there were scenes in this film that’d make your toes curl. That’s why they brought a horror writer in, after all! Then a month or so before release, it became evident the film would be getting an MA release. I was assured at the time the DVD would be uncut, so at least I could fall back on that. However, it has to be said that making the film a little more palatable also opened it out to a much wider audience. Roadshow backed it in a big way, even putting up billboards and buying TV spots. How many Australian horror films get that? And the film justified it with its box office, becoming the number one film in the country its first week, which is almost unheard of for local horror. MONSTER: Do you see this success helping increase awareness in the horror genre here? STERNS: I think the entire Australian industry’s in trouble. The Babadook, which is by all accounts a wonderful film, hasn’t performed well. The Rover — not a horror film, but another lauded locally-shot flick, actually shooting alongside us in Hawker last year — has also failed to attract numbers. There was an article in the papers recently claiming that Wolf Creek 2 had been illegally downloaded two million times already. There are arguments back and forth about piracy, in some quarters that it encourages a culture in which film and television is central, and that it complements legal, profitable avenues that still return income; in other quarters that it’s destroying the low-budget and mid-tier films. I waver between the two. It took us years to get Wolf Creek 2 financed, despite its pedigree. I know that trying to get original genre works, or indeed any Australian-made films, is even harder now, if not impossible. If people realised how difficult it is to get a film financed, let alone dreaming up the idea, writing the script, getting the right actors, finding an enthusiastic director, securing sales, then maybe they might value others’ work a little more. MONSTER: You wrote Origin: Wolf Creek. How did you get involved with the first Wolf Creek novel? STERNS: My background is in fiction, having written short stories for many years. Penguin approached Greg about the possibility of novelising the films, but this morphed into an idea of exploring Mick Taylor’s backstory. He hints at a few things in the first film, about being the head kangaroo shooter on a station, for instance, and people have often asked about his past, and how it might have contributed to what he became. I’ve researched serial killers extensively, so when Greg asked me straight off the bat to write one of the novels in a proposed series of six, I said yes, as long as it’s the first one. The juicy ideas are always in the origin story, and the more I thought about it, the more I realised Mick’s upbringing was unfolding in my head. After a quick research trip to outback Queensland following an interview with John Jarratt to get his thoughts on Mick’s genesis, I wrote the first draft in three months. A whirlwind. MONSTER: How much input did John Jarratt have with forming Mick Taylor, in regards to the script for Wolf Creek 2 and the book? STERNS: The first thing I did upon signing the book contract was sit down with John. I knew he had particular ideas about Mick’s psychopathology, and he proved a wealth of insight. Even more rewarding were a couple of anecdotes he gave me, and some of his own history growing up in Aramac in central Queensland. I was so fascinated by the place I took a trip up there and set Mick’s hometown there, though it’s called Erebli in the novel. As for the film, John suggested Mick riding the horse after Paul — I had Mick commandeer a paddock wagon — and he contributed quite a bit of the vernacular. There’s no one that knows Aussie slang like John — though “nun’s nasty” is mine. MONSTER: What’s next for you? STERNS: I have a multitude of projects in the works. Hopefully I can even talk about some soon. MONSTER: On a scale of 1 to 10 how bloody awesome is Monster Pictures? STERNS: This is where I say 11, right? The MonsterFest Fil Festival is huge for horror in this country. I’m hoping it can do a little bit of a crossover with fiction as well at some stage, particularly in that I straddle the two, because fiction always seems the poor stepchild of film when it comes to horror. Hopefully, Monster Pictures can continue to grow, and become the conduit for great horror to be produced here, too. « Best Screenplay at Nocturna Film Festival 2014!